Chocolate, caramel, nutty and toasty notes come from the Chocolate, Marris Otter and Victory malts with a balanced hop profile. This malty full flavor English Brown Ale is an homage to the traditional English style. Chocolate, caramel, nutty and toasty notes come from the Chocolate, Marris Otter and Victory malts. 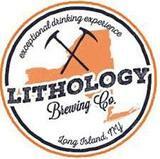 Three distinct hop additions gives the Lithology Brown Ale a balanced profile without over complicating the taste. Note: Silver medal winner at 2016 New York International Craft Beer Competition.